When Debbie and I arrived at Hodges Gardens State Park it was raining heavily. So nice. This marked the 2nd day consecutive day of significant rainfall for the Sabine/Natchitoches Parish area, which brought the first measurable precipitation to most of the area in more than a month. Triple digit midday temps were traded for upper 70s. We met at 10am, and the rain continued heavily for the next hour and a half. I caught glimpses out the window from time to time, and the rain appeared to fall in tender pieces and sheets across the large open field in my view. The historic aerials were awesome. 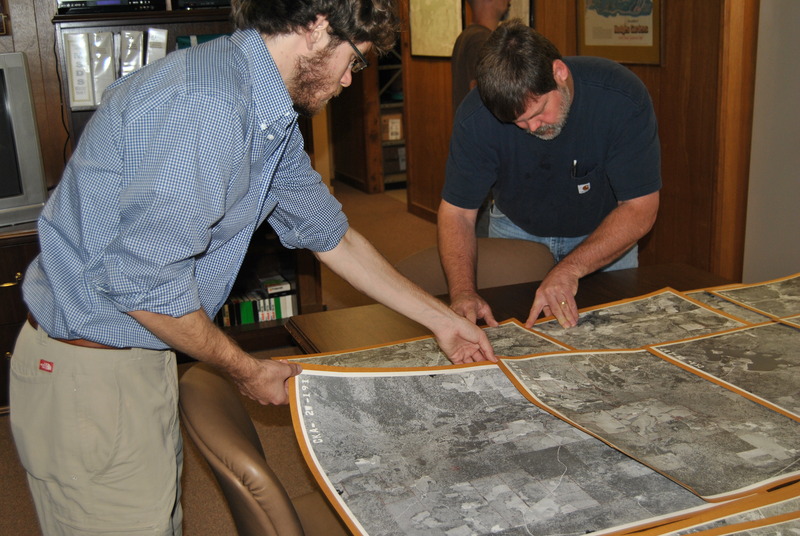 With coverage of most of Sabine Parish, we spent a little time matching up adjacent shots. For our purposes, I am thankful that our site is centered around a 225 acre lake. This water body made finding our area of interest within the greater coverage area much easier. 1959 U.S. Forest Service aerial images. Lining up adjacent photos. With low vegetation and a flyover date of March 1959, these were excellent images. As we finished lining up images (2’ x 2’ each), I set up the scanner and laptop. Although I had set up the scanner’s software on my desktop computer back at the office, I failed to install it onto the laptop that we found in the office earlier that morning. So, (Laptop + scanner) – scanner software = no scanning. Lesson learned here: check and double check equipment/technology (especially any units being used for the first time) before heading to the field. Thankfully we were able to capture some decent images of the aerials with our camera. Although we plan to meet up with the images owner later to resume scanning, it was important that we captured copies in some form while we had the images present. Hope you enjoy the aerials below. These were saved from the dumpster several years ago when a young man was cleaning out a storage unit his father owned. After the U.S. Forest Service ended an office unit lease from the image owner’s father, these were left in a pile on the floor. 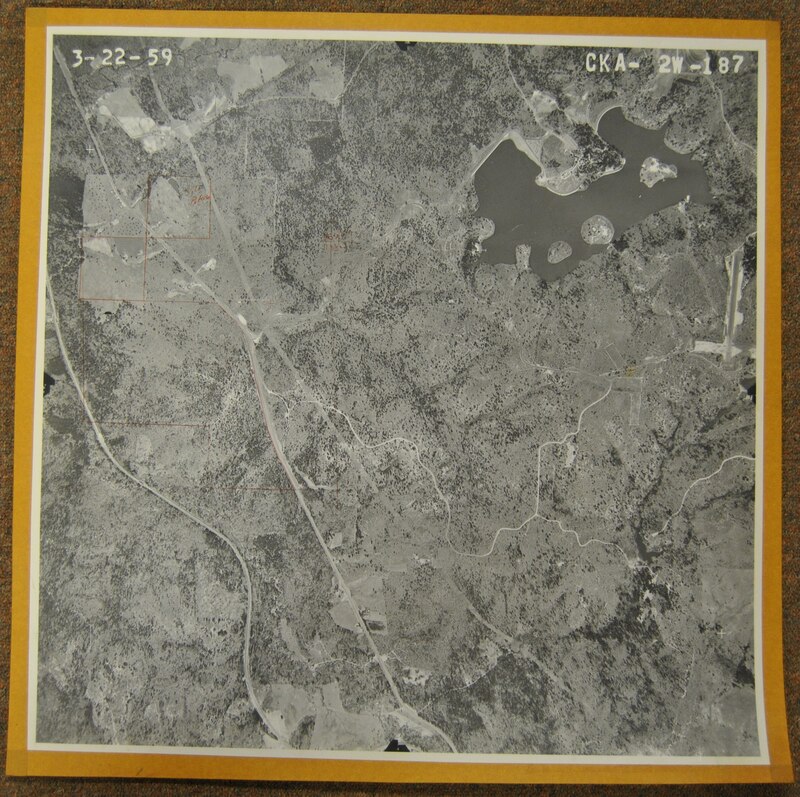 1959 U.S. Forest Service aerial; near Hornbeck, LA. We photographed every 2' x 2' image of interest without a flash. In case logistics delay scanning these originals in the future, these camera images will be quite helpful in our understanding the early layout of Hodges Gardens. 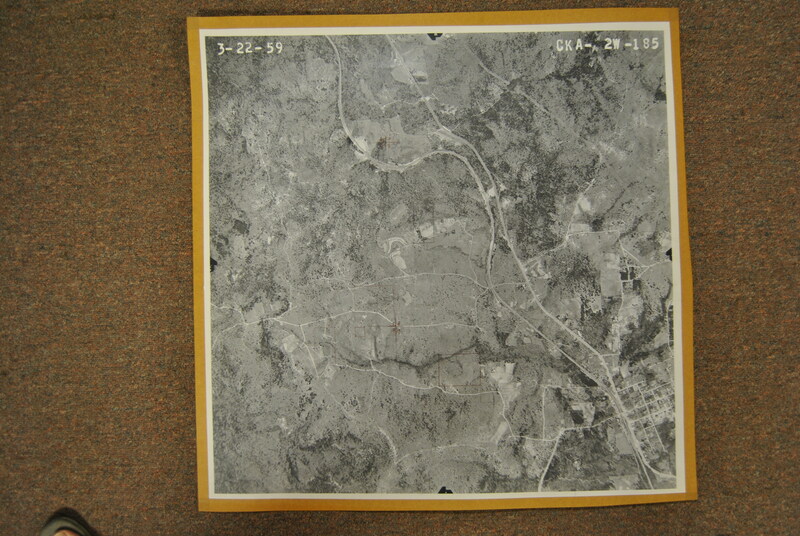 1959 U.S. Forest Service aerial image. Note the main lake and airstrip at Hodges Gardens in the top right. The three northwest to southeast running lines in the left half of the image, in increasing distance from the lake, are: a utility line, U.S. 171, and a railroad track. 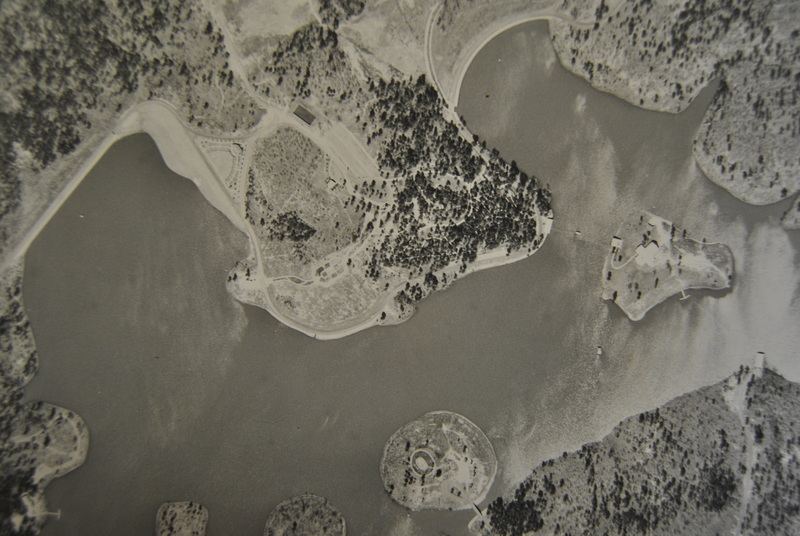 1959 U.S. Forest Service aerial; detail of lake and main gardens area, just two (2) years after its' opening to the public. Note triangular entrance area at top left, bridge to Flag Island (named Nandina Island at this time) at bottom middle (circular island), and the Hodges' private residence on House Island at middle right. The smaller structure at water's edge on House Island is a boat dock. Designed for accessibility, a ferry was set up to transport family or guests from the mainland to the island dock. An underground tunnel and elevator system was available to bring any persons from the dock into the house (perhaps into a basement room, as the island's elevation slopes upward in the middle).